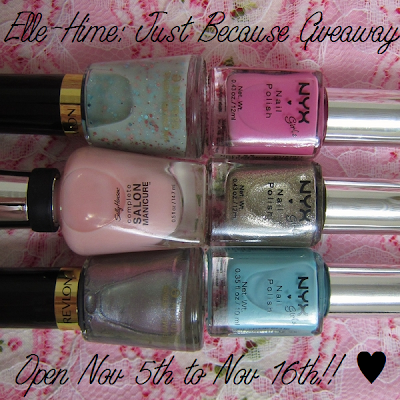 Princessly Polished: A Giveaway, Just Because! It's been awhile since I held a giveaway, and while trying to come up with a theme or reason for one I finally decided just to do it because I wanted to. Today marks 6 months of being married to the man of my dreams, so maybe the bliss has put me in an extra-good mood, as well. (; I'm using Rafflecopter as I have before, so you can enter using the widget after all the details below! Sally Hansen Complete Salon Manicure in Shell We Dance? - a sheer French Manicure color! Revlon in Whimsical - a very pretty mix of glitters floating in a sheer base. Pictures here! Revlon in Smoldering - a murky duochrome polish. See my post here for pictures! 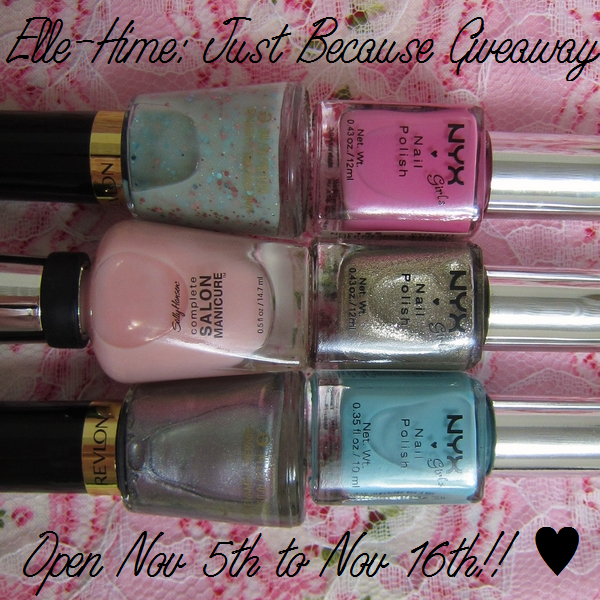 Nyx Girls Nail Polish in Girly - a creme, Mushroom Glitter - a foil, and Pistachio - a creme! International followers, I'm sorry, but I'm not allowed to mail you nail polish. However, if you have someone within the states who can receive your prize I'll be happy to mail to them for you!